I love Waldorf Chicken Salads… the combination of apple, walnuts, balsamic… so delicious! I didn’t feel like making a salad for dinner because I have been eating salad for lunch, so I made Waldorf Chicken Bundles instead. All the ingredients of one of my favorite salads in a dinner time meal! Slice the green apple and celery into small pieces. Take each chicken breast and make a small slice lengthwise, not going through the entire breast. Cut it open so it looks like a pita pocket. Stuff each chicken with the green apple, celery, and goat cheese. Sprinkle salt and pepper over the top of each chicken breast. In a baking pan, bake the chicken at 375 degrees about 30 minutes, until chicken is cooked through. When the chicken is almost done, reduce the balsamic. Pour the balsamic into a small pan, heat on medium high heat. It will boil down to half and make a syrup. Don’t let it sit as a syrup in the pan, make sure you make the syrup when the chicken is just about ready. 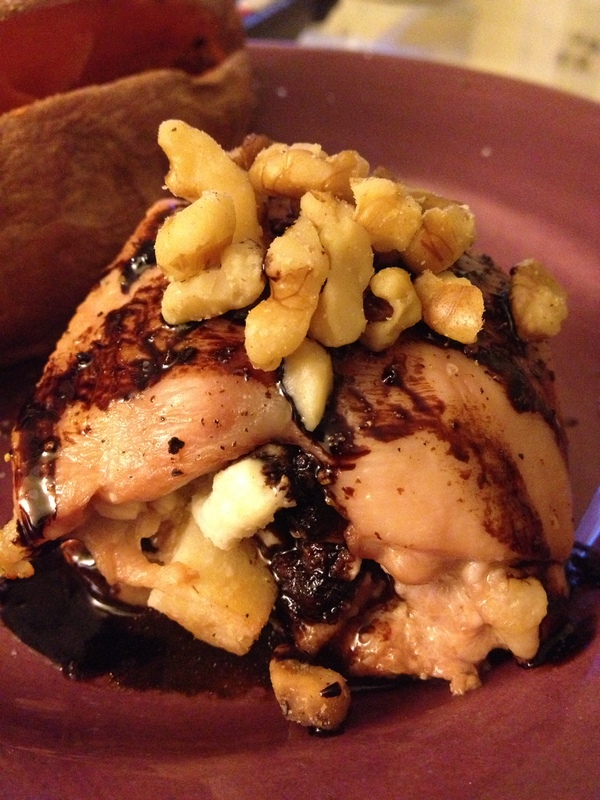 When the chicken is cooked, pour the balsamic syrup over each chicken breast, sprinkle walnuts on top, and serve hot! Knowing that big meals often come with the holiday season, I have been trying to make some light meals to maintain some sort of balance. This past week, I made a very filling but lightly flavored salad. 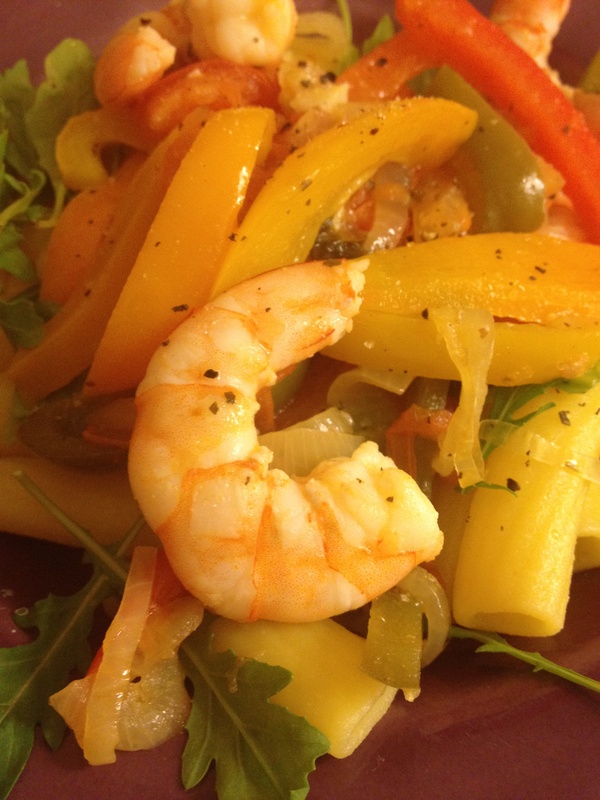 It has easy and fresh ingredients. And, if you don’t like tofu, you could easily use grilled or baked chicken pieces. 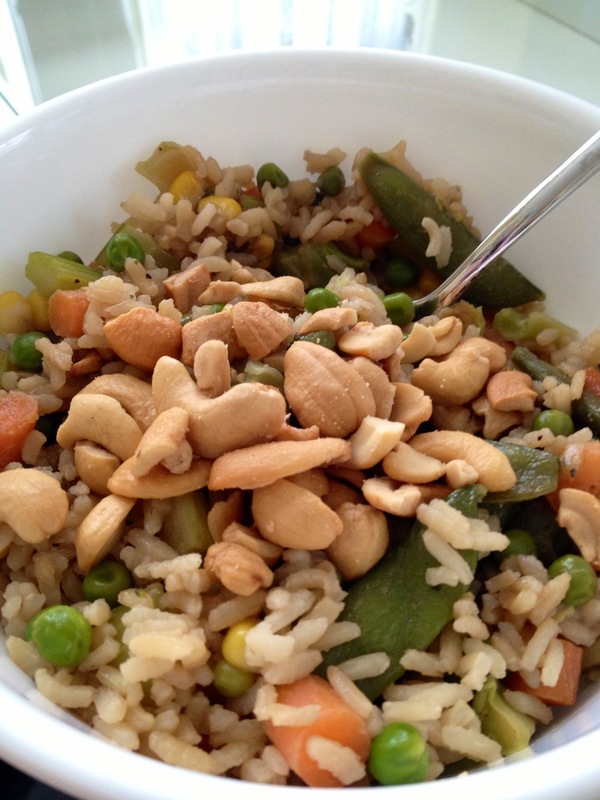 The recipe and ingredients here are enough for several days of salads! Drain the diced tofu and place the pieces in between two dish towels to dry, about 30 minutes. Chop all your salad produce- the lettuce, celery, grapes, apples, and scallions. In a large skillet lined with cooking spray and over medium heat, place the dried tofu. Drizzle 2 tbsp. honey and the sesame seeds over the tofu. Stir the tofu every 4 minutes, making sure to cook all sides evenly. You will know that the tofu is done when it starts to brown to your liking. When the tofu is done cooking, assemble the salads by plating the lettuce and adding a handful each of celery, grapes, and apples. Top with a handful of tofu and a pinch of scallions. For the dressing, combine 2 tbsp. honey with the olive oil, white wine vinegar, apple cider, and salt and pepper. Shake well. Pour 2-3 tbsp. of dressing over your salad. 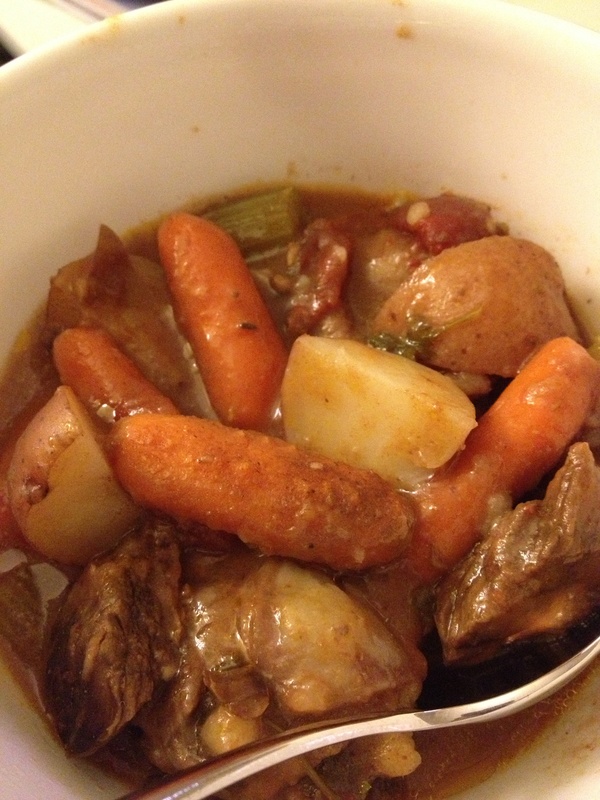 I am visiting with my parents this week, and in addition to loving the warm weather, I have been loving my mom’s cooking. She is such a fabulous cook, and I learn so much when I am with her! 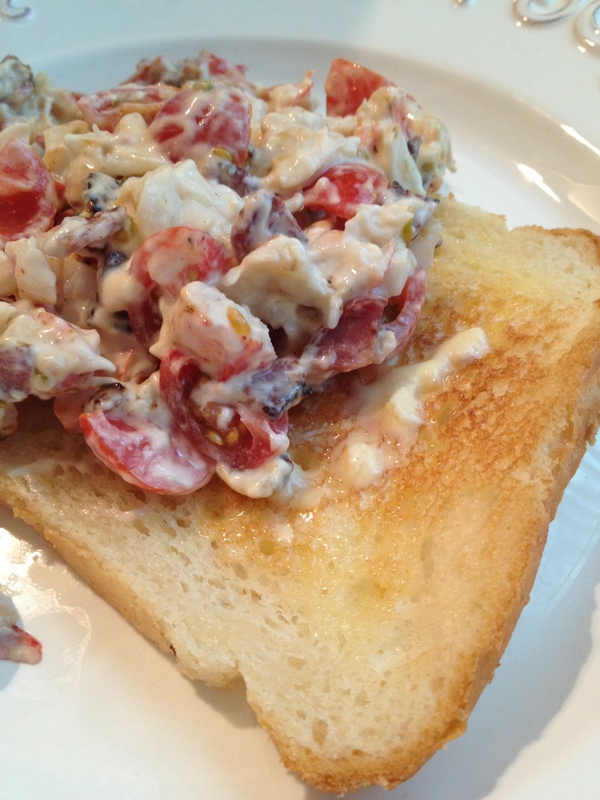 This week she made Tarragon Potato Salad to go with grilled steak tips. 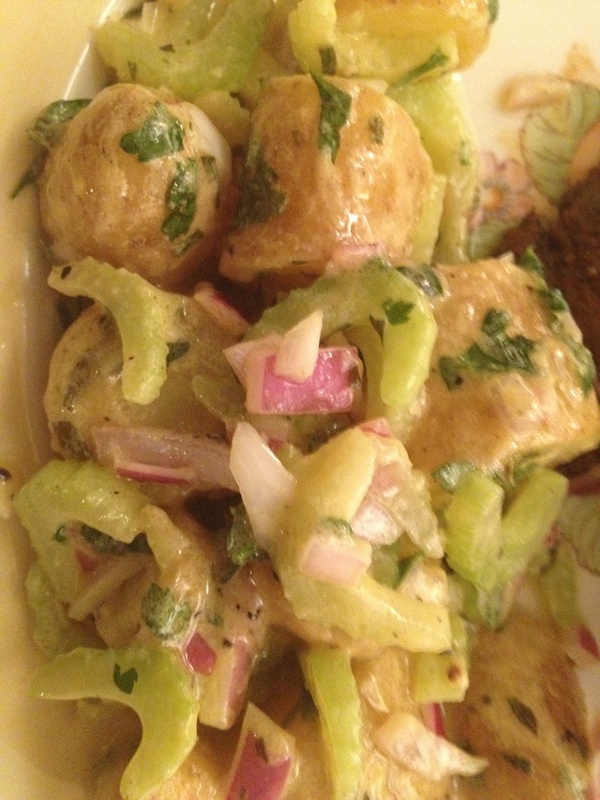 The potato salad is a fresh and light version of traditional potato salad, and doesn’t use any mayo. Perfect for the summer weather! Once the potatoes are washed and cut into quarters, steam them. Do not rinse the potatoes, but let them cool. In a large bowl, combine the red onion, celery, dijon mustard, white wine vinegar, olive oil, parsley, tarragon, lemon rind, salt, and pepper. Whisk to combine. Add the cooled potatoes and stir to cover the potatoes with the dressing. I hope everyone enjoyed their holiday weekend! I know that I certainly did, with my favorite foods and people. Even though food holidays can be tough, I have learned to make smart food choices, and realize that I do actually have choices. Even though my Thanksgiving plate didn’t look like everyone else’s, that didn’t mean that I didn’t enjoy it! I had turkey and root vegetables, with my favorite starter of shrimp cocktail! Nothing too shabby about that. 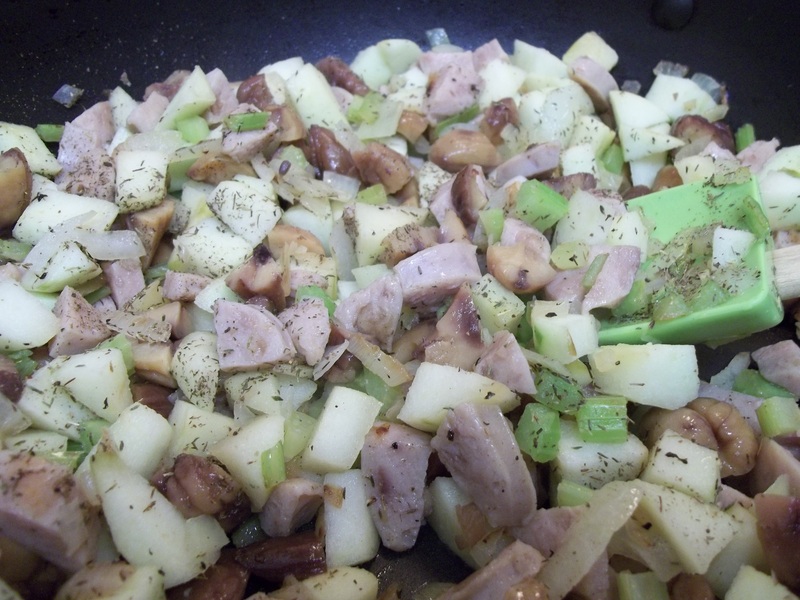 In a large pan coated with olive oil, add onion and celery. Stir for a few minutes until they start to get tender. 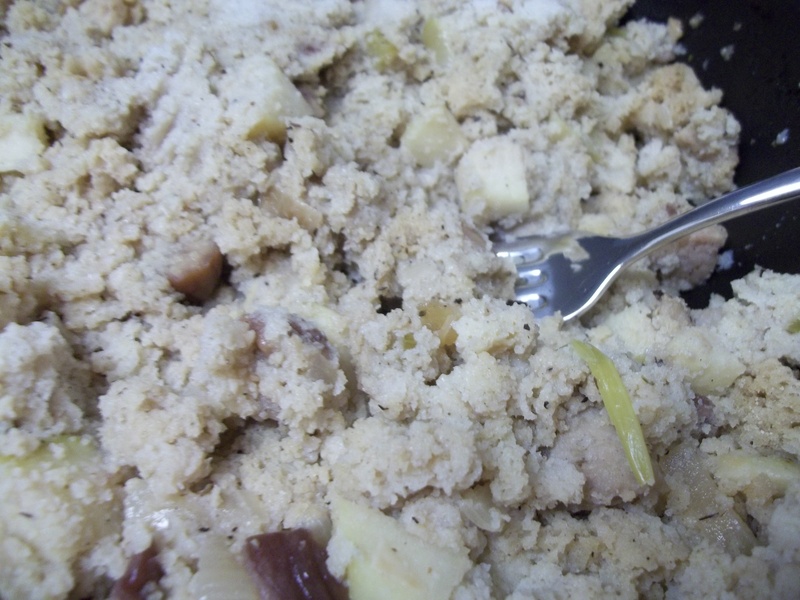 Add the sausage and apple bites, stirring to let the flavors mix and mingle. When the fruit and veggies start to really tenderize, and the sausage starts to cook, add the parsley, thyme, chestnuts, and stuffing bits. Stir together to incorporate. Add vegan butter pads on top and pour in chicken broth. Bake covered for 45 minutes, until everything cooks through. Well… I’m off to enjoy the best part of Thanksgiving… leftovers! Happy Allergy Free Eating.